A major study published on Tuesday 19th September 2017, in the US Government’s Environmental Health Perspectives has found that children born to mothers exposed to fluoride while pregnant, have significantly lower IQ scores. This is particularly relevant to New Zealand where half of the population is currently subjected to fluoridation. The study measured fluoride in urine and found the average level of fluoride in urine was 0.9mg/L (mg/L = parts per million). To relate this to water fluoride concentration, a separate study found that pregnant women in an area with 0.4 to 0.8 ppm water fluoride only had slightly lower urine fluoride than the average participants in this study. The Ministry of Health recommends fluoride chemicals be added to the water at 0.85ppm. Pregnant women in New Zealand in fluoridated areas likely have similar levels of urine fluoride as those in the Mexican study. Urine fluoride reflects total fluoride intake from all sources, not just fluoridated water. The paper also reports that in the USA, which is 70% fluoridated, urine fluoride ranges from about 0.5 to 1.5 mg/L which fully overlaps the range found in the Mexican study. 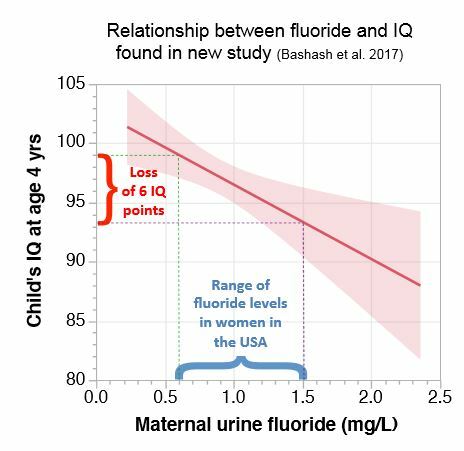 The child of a mother who was drinking water with 0.85ppm fluoride would be predicted to have 5 IQ lower IQ points than if the mother had drunk water with close to zero fluoride in it. This obviously has huge consequences for New Zealand children. The Ministry of Health recommended 1ppm until the 1990s when it reduced to a range from 0.7ppm to 1ppm, with a target of 0.85ppm. The US Human and Health Services have directed a maximum of 0.7ppm for fluoridation. This study was very carefully done by a group of researchers who have produced over 50 papers on the cognitive health of children in relationship to environmental exposures. It was funded by the US Government’s National Institute of Health and was a multi-million dollar study. This was the group’s first study of fluoride – their other studies mostly dealing with lead, mercury and other environmental neurotoxicants. This study controlled for a wide range of potential factors that might have skewed the results and produced a false effect. It was able to largely rule out confounding effects by these other factors. The factors ruled out included lead, mercury, socio-economic status, smoking, alcohol use, and health problems during pregnancy. This study offers confirmation of previous studies in Mexico, China and elsewhere. Some of those studies had higher fluoride exposures than are commonly found in fluoridating countries, but many did not. The sole study in a country with artificial water fluoridation was by Dunedin dentist Jonathan Broadbent. That study found no association between water fluoridation and IQ and was trumpeted by fluoridation defenders. But that study was shown to have almost no difference in TOTAL fluoride intake between the children with fluoridated water and those with non-fluoridated water, since at least half of the children in the non-fluoridated area were given fluoride supplements. This left only a small proportion of the study children without substantial fluoride exposure. Nor did this study look at maternal fluoride exposure during pregnancy, which could be the most vulnerable time of exposure. The study authors are cautious in their conclusions, as is common for scientists. But the implications of this study are enormous. There have been 58 other human studies looking at fluoride exposure and harm to the brain – 51 of them have found an association. Prof Paul Connett, director of Fluoride Action Network explains the implications in this 3 minute video.